Canal Way Scenic Byway is Ohio's second nationally designated Scenic Byway. The byway starts at Cleveland's Carter Road Lift Bridge and ends 110 miles south, at I-77 in Tuscarawas County. This byway approximates the path of the old Ohio and Erie Canal, from Cleveland to Dover. The scenery found along the Canal Way Scenic Byway is interestingly diverse. It ranges from the heavy industrial area of Cleveland Flats to the rolling hills and farmland. 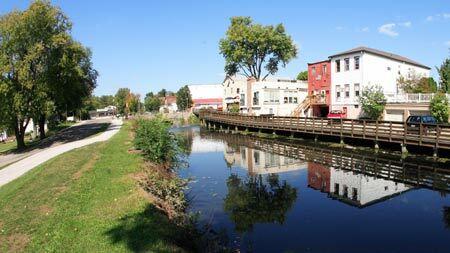 You can also see the remnants of the towns and villages associated with the canal, as well as 200-year-old architectural styles. From Cleveland take I-71 north to the Innerbelt, turn left on Eagle Avenue and travel west to the intersection of Carter Road where the byway begins. When traveling from Dover or New Philadelphia take Exit 83 from I-77 and proceed east on SR 211. The Akron Museum of Art houses regional, national and international works dating from 1850. The Cuyahoga Valley National Park preserves 33,000 acres along the Cuyahoga River between Cleveland and Akron. The Cuyahoga Valley Scenic Railroad travels along the CVNRA from Independence to Akron. Hale Farm and Village provides the sights, sounds and smalls of a bustling Western Reserve township in 1848. Visit with artisans such as glassblowers, candle makers, potters and blacksmiths demonstrating the industries of the mid-1800's. Historic Fourth Street District, listed on the National Register for its architectural excellence and variety, is also famous for its stations that serves the Underground Railroad. J.E. Reeves Victorian Home, located on SR 800 is a magnificent 19th century farmhouse that has been restored to the splendor of the era. Dunham Tavern, located at 6709 Euclid Ave. in Cleveland, is Cleveland's oldest building that is still standing at its original site. This museum houses collections from its original tavern days dating back to 1824. Playhouse Square is the nation's second largest performing arts center. The Warehouse District runs along Cuyahoga Valley near Lake Erie. This collection of businesses and historic buildings became the central business district of Cleveland during the mid-late 19th century. Mill Creek Falls was established by settlers in Newburgh Township in 1799 on the Indian Trail that later became Broadway. Waterpower generated by Mill Creek's 45-foot waterfall gave gave Newburgh a distinct advantage over Cleveland. Mill Creek Falls is part of the Cleveland Metroparks System. Cleveland Metroparks Zoo offers byway travelers a diversion while entertaining children of all ages. The construction of the Ohio and Erie Canal in 1825 drastically changed the people and pace of this region. Many Byway visitors travel this route to learn about the development of the pre- and post-canal eras. The route also offers an impressive display of historical sites, along with many opportunities for hiking, biking, and water sports.